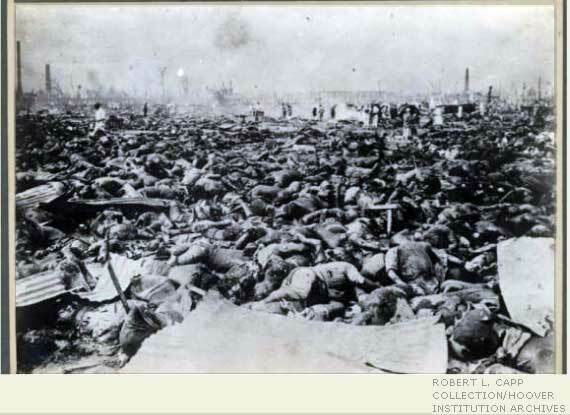 Even if we accept that there was a plausible military imperative to drop the atomic bombs on Hiroshima and Nagasaki – to bring about a swift defeat of Japan and thus an end to the Pacific War – the horror of civilian death toll from those two no-warning aerial attacks places a disturbing question over the supposed ends justifying the means. But what if the official military rationale touted by US President Harry Truman and his administration turns out to be bogus? That is, the real reason for dropping the A-bombs on Hiroshima and Nagasaki 70 years ago on August 6 and 9, 1945, had little to do with defeating imperial Japan and saving the lives of American troops. What if the real reason was the deliberate and cold-blooded demonstration of raw military power by Washington in order to warn the Soviet Union of America’s postwar demarcation of global hegemony? That leads to the most chilling conclusion – a conclusion far worse than the official American narrative would have us believe. For it means that the act of obliterating up to 200,000 Japanese civilians was an event of premeditated mass murder whose intent was solely political. Or, in other words, an ineffable act of state terrorism committed by the United States. This conjecture about the ulterior motive for the American atomic bombing of Japan has been around for many years. In January 1995, the New York Times reported: «Indeed, some historians contend that the bombing was not aimed so much at the wartime enemy Japan as at the wartime ally Soviet Union, delivered as a warning against postwar rivalry». With complacent equivocation, the New York Times did not follow through on the horrendous implications of its own partial admission for why the atomic bombs were dropped. If the official US calculation was indeed «a warning against postwar rivalry» to the Soviet Union, then that makes the act an indefensible political decision that had nothing to do with a moral imperative of promptly ending a war. It was, as noted, a supreme act of terrorism. Professsor Gar Alperovitz – one of several American historians – has over the decades compiled a compelling case that the Truman administration did in fact make the decision to use the A-bombs as a political weapon against the Soviet Union. The author of ‘The Decision to Use the Atomic Bomb’ wrote: «Though most Americans are unaware of the fact, increasing numbers of historians now recognise that the United States did not need to use the atomic bomb to end the war against Japan in 1945. Moreover, this essential judgment was expressed by the vast majority of top American military leaders in all three services in the years after the war ended: Army, Navy and Army Air Force». Alperovitz cites then US Secretary of War Henry L Stimson and such military luminaries as General Dwight Eisenhower and Joint Chiefs of Staff Admiral William D Leahy who were explicitly opposed to using the A-bomb on Japan. Eisenhower said it was»completely unnecessary» while Leahy noted: «The use of this barbarous weapon at Hiroshima and Nagasaki was of no material assistance in our war against Japan. The Japanese were already defeated and ready to surrender». This points to covert political decision-making during the critical three-week period between the Potsdam conference (July 17-August 2 1945) and the dropping of the A-bombs on Japan. During that period it appears that Truman and his aides decided in secret that the then Soviet wartime ally was to be henceforth made the postwar enemy. The Cold War was being formulated. Bear in mind that for months before Potsdam, the US and Britain were appealing to Russian leader Josef Stalin to join the Pacific War soon after the defeat of Nazi Germany. Two months after the Third Reich was vanquished in May 1945, the Potsdam conference between the Big Three allies achieved the much-anticipated commitment from Stalin to redeploy the Red Army against Japan. The Soviet Union was scheduled to officially enter the Pacific War on August 15. As it turned out, Stalin ordered the Red Army into Manchuria on August 8, a week ahead of the scheduled offensive. As Harry Truman gleefully wrote in a private letter during Potsdam this commitment from the Soviet Union meant that «the Japs were finished». However, the successful testing of the first A-bomb by the United States in the desert of New Mexico on July 16 – only the day before begining the Potsdam summit – was a point of no return. With this awesome new weapon, US planners must have quickly realised that they could finish the war against Japan without the Soviet Union entering the Pacific theatre, by dropping the A-bomb. But the primary US objective wasn’t to finish the Pacific War per se. American and British military chiefs and intelligence were convinced that the mere entry of Russia into the war against Japan would precipitate the latter’s surrender. And besides the American invasion of mainland Japan was not planned to take place until November 1945. It seems clear then that the Truman administration rushed ahead to use its new atomic weapon on Japan because its concern was to circumscribe any advance by the Soviet Union in Asia-Pacific. Not only was the Red Army poised to take Manchuria and the Korean Peninsula but mainland Japan as well. Hiroshima and Nagasaki – two civilian centres of no military value – were thus selected as the venues for demonstrating the most spellbinding act of terror, not to an all but defeated Japan, but to the Soviet Union. The atomic bombing of Japan was therefore not the last act of the Pacific War, as the official American narrative contends, but rather it was the first, brutal act of the nascent Cold War by the US towards Soviet Russia. That puts the horrific events in an altogether different criminal light. Because the atomic bombings can then be seen as a deliberate act of mass murder for no other strategic reason other than to intimidate a perceived geopolitical rival – Moscow. Seventy years on, history proves that this barbaric logic of the US ruling elite still holds. After the official end of the Cold War nearly a quarter of a century ago, Washington has evidently no intention of disarming its nuclear arsenal. In fact, the US government under President Barack Obama is planning to spend $355 billion over the next decade to upgrade its stockpile of some 5,000 nuclear warheads – each many times more powerful than the A-bombs that were originally dropped on Japan. Furthermore, Washington has offiicially declared Russia, along with China, as its top strategic enemy, as recent as this month, according to senior Pentagon figures. The unilateral withdrawal by the US from the Anti-Ballistic Missiles Treaty in 2002 and the ongoing expansion of US missile systems on Russia’s borders and in the Pacific with provocative reference to China are testimony to the inherent bellicose intent that resides in Washington. As with the first and only use of nuclear weapons 70 years ago, the US logic that led to the holocaust at Hiroshima and Nagasaki is a barbaric logic than pertains to this day. It is still being aimed at Russia, as it was seven decades ago. Only the full exposure and eradication of this uniquely American barbaric logic will lead to peaceful international relations. This entry was posted in anti-war, culture, Empire, Geopolitics, History, society, State Crime, war and tagged A-Bomb, Atomic Bomb, Cold War, Dwight Eisenhower, empire, Gar Alperovitz, Genocide, Government Psychopothy, Harry Truman, Hiroshima, Japan, Nagasaki, Nuclear War, radiation poisoning, Soviet Union, State Terror, The Greatest Generation, War Crime, World War 2, WW2. Bookmark the permalink.